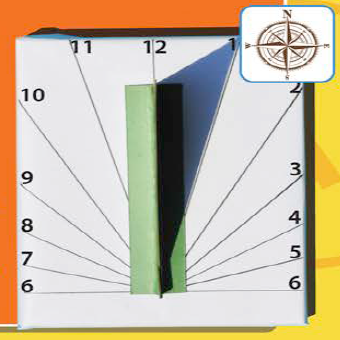 A sundial is a time keeping device that measures time using the position of the sun. 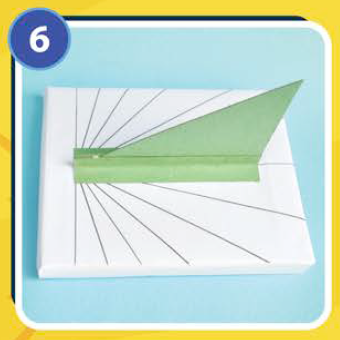 The earliest sundials were used by ancient Egyptians around 3500 B.C. Wrap your box with white paper. 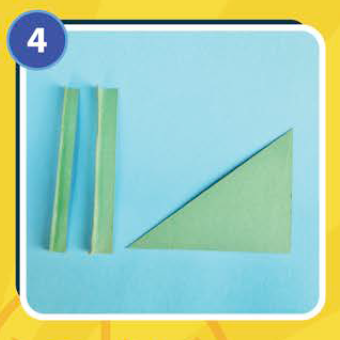 Draw a base line at the bottom. 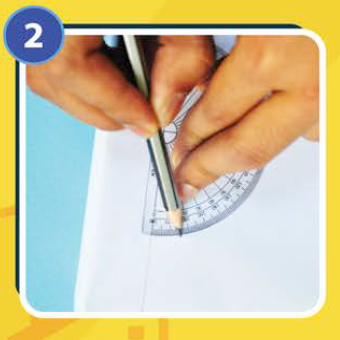 Mark out points 15° apart using a protractor, starting from the base line. 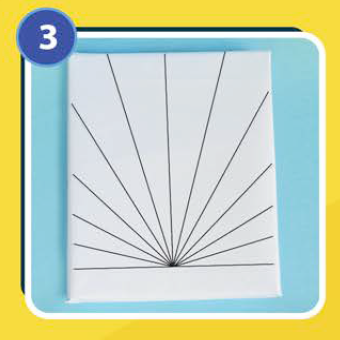 Draw lines from the center through these points. The sundial’s face is now ready. To make the gnomon cut the shapes as shown from mount board. 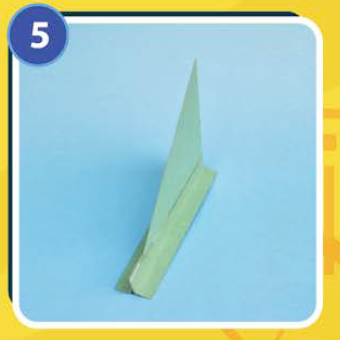 Fold the strips in an ‘L’ shape and paste them on either side of the triangular piece. Paste the gnomon along the middle line of the sundial and label as shown on the next page. Since sundials can’t be used indoors or after sunset, the Greeks, Romans and Egyptians used a water clock or a clepsydra (klep-sid-ra). 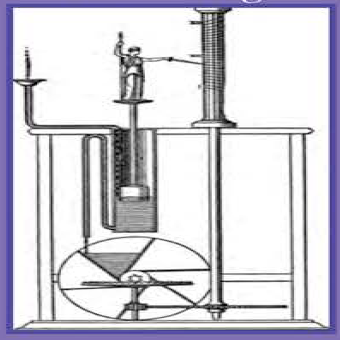 These devices would measure time with the help of a stream of water flowing from a container. The water would fill another container with markings which would tell what time it was. With time, water clocks became more complicated and hourly intervals would also be marked by chiming bells, moving figurines etc. The world’s largest sundial is at the Jantar Mantar in Jaipur and is called the Samrat Yantra. It was built by Sawai Jai Singh between 1727 and 1734. 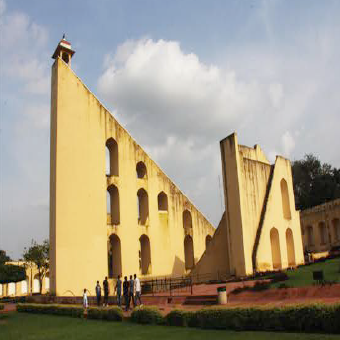 The Samrat Yantra stands 27 meters tall and is accurate up to two minutes of the actual time. 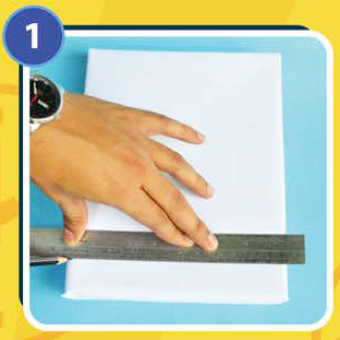 You can adjust a sundial with a magnetic compass or a watch. For it to work properly it needs to face north. This is because the sun moves from east to west. If our sundial faced east or west, the shadow of the gnomon (the time-telling edge) would fall under it. By aligning the sundial on the north-south axis with a compass, we can get the longest shadows. Once placed a sundial must not be moved. The sundial can also be calibrated with a watch by simply placing the sundial in such a way that the time according to your watch is the same as what the sundial reads. For example, if the time according to your watch is 1:00 p.m., adjust the sundial in such a way that the gnomon’s shadow touches the 1 p.m. line. 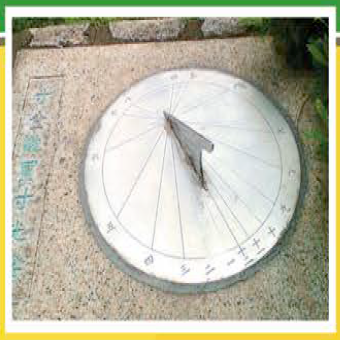 Since sundials tell the local time according to the sun, it may be off from the current time.